Right on the heels of getting caught up from our last weekend away we skipped town again this past weekend, this time in celebration of (I was going to say that I hope you’re sitting down for this, but I suspect it is only us who are bowled over by these numbers) our three-year wedding anniversary and our five-year dating anniversary. Whoa. I had been angling to go out to the North Fork of Long Island ever since a friend went on and on about what a wonderful place the Table and Inn was. Run by four former restaurant-types, including the fantastic pastry chef, Claudia Fleming, her husband, the everything-else chef, and two former front-of-house managers, the place is cozy and delicious. In a way, these people are living the dream; away from the frenzy of the New York City food scene, they get to cook the food they want and know the people who supply them with it–mostly from the nearby farms and wineries. We got to live the dream, too, so to speak, spending the first afternoon at a near-deserted public beach. (So different from Brighton, you know, New York City’s take on a public beach, I had to giggle.) Saturday, or the day that storms threatened to ruin our weekend, we used the gray day to visit six (6!) 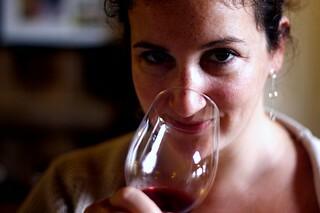 wineries and my, my, do I love New York wines. In fact, I find them to be the polar opposite of the current Napa style, so light and bright and delicious, it took restraint to limit our purchases to thirteen bottles of wine. That night, we had a dinner so good at the restaurant, it defies words, though I suspect they’ll slip through in the coming paragraphs and weeks. … I hesitate to even call these by their name, because if I do, you will summon in your mind all the terrible and disappointing scones you have eaten in your life–and by that, I mean most of them–and not fully come to terms with the amazement that these are. They’re unbelievable. Quite possibly, the most moist scone I have ever eaten and so lightly sweetened, they taste like breakfast, not dessert, as they should. Sure, she’s more famous for coconut tapioca with passionfruit sorbet and caramelized upside-down peach cobblers (oh, and an out-of-print book they cruelly sell only at the Inn, that you will surely see creations from in the coming months), but one bite of these, and you’ll know why she’s Beard Awards material. And also, welcome in the smitten kitchen any day. More North Fork: I had more pictures than I could fit in this post! The rest are over here. Scones, previously: Look, I know what you’re going to say. “What about the dreamy creamy scones?” And here is my response: Please don’t make me choose! I have room in my scone-loving gullet for both recipes, and so should you. 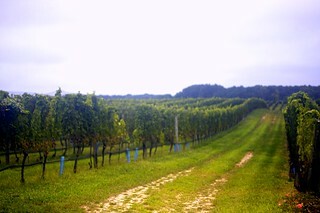 The wineries of the North Fork: This is in no way an exhaustive list, and we are in no way wine connoisseurs. We simply like what we like– as you should too–and these were our favorites from our whirlwind tour. Paumanok (we fell head-over-heels for the Chenin Blanc and the Sauvingnon Blanc), Shinn Estate Vineyards (Coalescence and Estate Merlot), Borghese (the oldest winery on the North Fork, we preferred the reds: Cabernet Franc and Pinot Noir), Peconic Bay (this was our hands-down favorite; we tried six wines and liked them all, but actually left with the Rose of Merlot, Reisling–not sweet at all!, Chardonnay and Merlot) and Lenz (Merlot and sparkling Cuvee). Guess what everyone’s getting for their birthday this year! The scones are much lighter, softer (and tastier) and significantly less sweet than those that you’d get in your average coffee shop, with a craggy outer shell-like edge that holds them together fantastically. This recipe is adapted from the North Fork Table & Inn’s website, and oh, how courteous it was to come home, long to get the weekend back, and find that a piece of it was available to go. However, when I attempted to make these in the yesterday–twice–I defied what I consider the most important rule in the kitchen: Do not cook when you are rushed or distracted. I left a cup of flour out of the first batch, which actually made a wonderful scone-like muffin, should you be inclined to repeat my mess. And while I got all the ingredients right on the second batch, I cut them way too large (8 wedges, what was I thinking?) and baked them right up next to each other (I repeat, what was I thinking?) and ended up with one pan-sized mega-scone. Albeit, a delicious one. 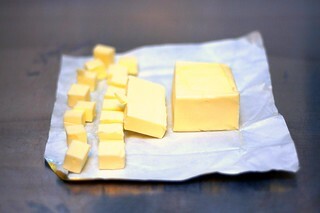 Place cubed butter in freezer for 15 minutes. Meanwhile, measure other ingredients (except buttermilk and fruit) and mix in the bowl of a food processor. Add butter to processor bowl and mix until the butter and flour mixture are the texture of coarse cornmeal. Transfer the mixture to the bowl of a mixer and add buttermilk and fruit, mixing on the lowest speed until the dough just comes together. Turn out onto a lightly floured surface and knead gently a couple times. Roll dough out to approximately one-inch thickness (I skipped the rolling pin and just patted it out with floured hands) and cut into squares. Cut those squares again on the diagonal, creating triangles. Sprinkle with coarse sugar, if you’re using it. Bake on an ungreased baking sheet (mine stuck ever-so-slightly, so I might line it with parchment next time, though no biggie if you don’t) for 25 to 30 minutes, until lightly browned. * If you use fresh fruit in a scone, it’s very important that you use an aluminum-free baking powder, or your scones will turn out as blue as mine did — not a pretty sight! Frankly, aluminum-free baking powder is always best to use, especially if you’ve noticed a tinny taste in your biscuits, muffins scones; it is avoidable. Forgot to add that I *know* this is like the third or fourth sweet recipe in a row and that this is out of control, but I will compensate for it in the coming days, where I have one tomato recipe after another, all healthy! AT LAST. Ooh, we went on a tour of the North Fork for Labor Day weekend, but we did not stop by any of the wineries you listed above! Thanks for the reviews because we were planning on going back next weekend before the weather starts turning. We recommend going to Palmer…the only one we liked of the three places we tried (also see blog post about it on my website). I copied this down immediately for future use. Overly sweet, overly dense scones are my arch enemy. A mere 1/4 cup sugar sounds perfect! Well, I finally broke my own sweet streak the other day (eggplant is delicious, but not for dessert) but I see no reason why I can’t go back and continue it for delicious scones. Oh good, I’ve been waiting for a great introductory scone recipe! I don’t mind sweet post after sweet post. You are killing me with all these raspberry recipes. Raspberry bars, raspberry scones! Those 20 pounds of raspberries I picked last week won’t last long. 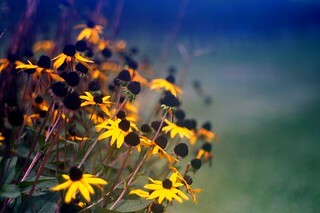 Ohh, what gorgeous pictures! Long Island really does have some lovely spots to visit. Instead of cutting the dough into squares/triangles – can you also use a cookie scoop and place them onto the baking sheet (like cookies)? Thanks for the tour of your getaway! 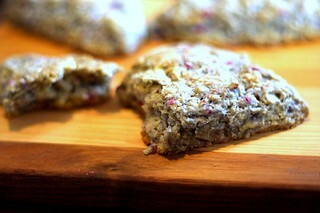 I love the idea of caraway in the scone..one of my favorite savory seasonings. About the wines…if you were to ask the majority of winemakers in any part of the country where the best wines come from..their answers would be surprisingly open minded. Because..they know that there are ways to get the best from the grapes that grow in various regions anywhere in the U.S. It’s an art and a science. Napa, New York, Maryland, Georgia, Oregon and other places unknown to me..they all have wines that are wonderful that articulate the best of that particular grape from the region. I’m partial to the Anderson Valley reds cuz I have access, but I’ve loved em from elsewhere just as much..the situation has something to do with it too! I’m so glad you enjoyed yourself on the North Fork, my second home. Thanks for posting the pictures, although next time I’ll make you take lots of pictures of me so that I’m guaranteed a good one. We’ll definitly do this again with a group of people next year. I have never had a scone I liked. They are always so crunchy and dry! I will have to give these a shot and see what I’ve been missing out in my scone-jaded state. Oh, how I love the North Fork. Not sure which wineries you visited but I hope Bedell Cellars was on the list – its our newest favorite, after a really fantastic tasting experience there on my birthday. 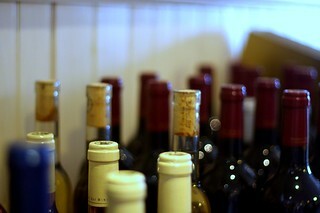 Paumanok is on our list for next time, we’ve been really enjoying their bottles at home recently. We live close enough to the fork that we’ve never really thought about staying overnight out there, but now I think we might need to. Great idea! Long time reader here…your recipes have absolutely never failed me (thanks!)! I do have a question about putting this dough together. I don’t have a food processor or a mixer, but I do have a blender – would that sufficiently do the job of the processor? Thanks! I have never made a dough before in the blender, however, two knives or a pastry blender should do the trick of the food processor. 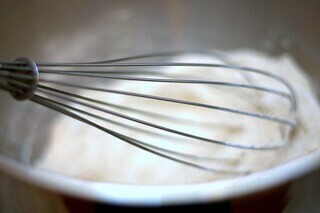 As for the mixer part, I don’t see why you couldn’t mix it by hand with a wooden spoon. 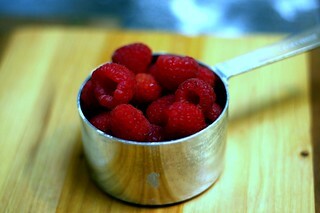 I just made scones the other day and … now I am going to try yours because I have fresh raspberries! Your trip sounds AMAZING. Way to go all around. yep….everybody thinks they are dry and tasteless til they get to try a decent recipe for scones….I lurve ’em!! The scones look smashing, I have some wild black raspberries I’ll use in them. 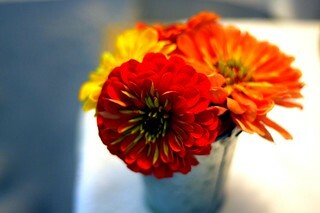 I think they will fit quite nicely with my afternoon cappucino. Am planning a brunch and will make these; yes, scones are often the great disappointment of otherwise good bakeries! 5 years? Wow…I can’t believe it’s been that long. kind of random questions but… can i substitute something in place of the buttermilk? i have a really hard time finding it in the store and when i do, the containers are usually much larger than the amount i need for the recipe. also, would frozen fruit work instead of fresh? Oooh I love the raisin-caraway combination. I’ve made many scones and breads with them. These look lovely! I don’t see why frozen fruit would work, as long as it was drained really well and defrosted. It is easy to make your own buttermilk: Mix 1 teaspoon of vinegar or lemon juice with 1 cup of milk and let it sit until it curdlesâ€“10 minutes. Deb, my whole family used to think the same horrible thoughts of scones until I was about 14…the year I entered the 4H baking contest at the Vermont state fair. The deal is that everyone does the same recipe and so are judged on an even playing field. The Date-Nut scones came out terrible. I followed the recipe to a T, but they were crisp on the outside and gooey on the inside…not done? Too done? In a last-ditch attempt to save my entry, I left them uncovered overnight, and brought them to the fair loosely packed the next morning. Dunno what magic happens overnight, but they firm up just a hair on the inside without getting stale on the outside. I love them, but they are usually too sweet for breakfast…maybe try these sometime soon! Holy Cow! Those look awesome. I love scones. I’m making those this weekend. Thanks for sharing! This is a bit off-topic, but I didn’t want to be accused of trying to enter the bag contest twice. If you all haven’t tried it already, go to the full entry & comments for the bag contest and do a “Find” for your town or city to see all the other locals who also love Smitten Kitchen and your favorite markets. I’ve had the best time searching for fellow Madisonians (as in Madison, WI) and reading all the loving entries about the Dane County Farmers’ Market (and the other great local markets). i had dinner at North Fork Table a couple years ago, and caught a glimpse of chef fleming working the kitchen! how great that you got to stay overnight, too! (i had no idea that her book was out of print–glad i have a copy. and i know many professional pastry chefs who take what i will call “inspiration” directly from that book.) paumanok chenin blanc is wonderful, i agree. nonononono deb, PLEASE!! keep the sweets comin’!! i love it! ok ok, you can post some savory, i won’t get mad. All right, I will try it but scone always tend to have some portion of it bitter or have the after taste. Am I doing something wrong? I grew up in Cutchogue (the little town where Peconic Bay Winery lives!) and I rave about it to anyone that’ll listen! I took my Philadelphia friends home for a wine and turkey fry weekend last October and we’ll be continuing the tradition his year. Next time you’re visiting you must go to the Village Cheese Shop on Love Lane in Mattituck! But Deb shh…we’re supposed to keep the secret of the North Fork quiet so that summer traffic stays to a minimum! *faint* I love scones. This goes on the list of to be cooked NOW. That’s all. Deb, when I clicked on the out-of-print book, the name “Gramercy Tavern” rang a bell in the dimly-lit recesses of my brain. A couple of years ago I ran across a recipe on Epicurious.com for a “Gramercy Tavern Gingerbread”. Have you ever heard of it or tried it? I’ve tried it and I thought it was wonderful, albeit different. It isn’t for the faint of palate who prefers the light and fluffy type of gingerbread cake. It’s very dense and intense in flavor. If you haven’t tried it before, I’d love it if you would try it and share with us all what you think. I’m going to have to try these wonderful-looking scones. I’m afraid I have yet to meet a carb I didn’t like. :) Thanks for sharing your weekend getaway. Thats sounds like a wonderful weekend and delicious looking scones. I hope to take a weekend trip up there someday. How wonderful! A breakfast recipe (which I always find short in supply), and it’s not too sweet! I’d try it and get back to you. Thank you for the lovely pics too! This is pretty similar to what has become the thing that all quests expect me to make when they spend a night at my house. (http://www.recipezaar.com/53296) I almost always use frozen strawberries, partially thawed, and chopped into bits. Sometimes I substitute soy milk with no ill effect. They are SO GOOD. There are 2 downstairs from yesterday calling to me right now! The North Fork Table & Inn is probably the East End’s best restaurant (and very well may be the best on Long Island), I’m glad to hear that you had such a great time and great eats there. 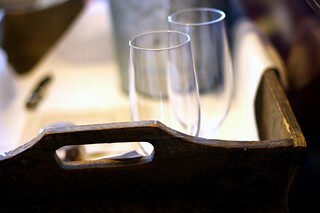 I’d love to hear more about the wineries you visited and what wines you liked best! I love scones and this is a recipe I have to try this week! 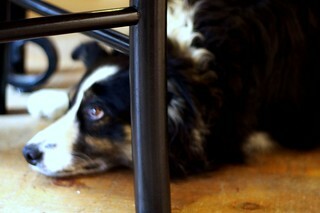 And BTW, what’s the Border Collies name under the table? I saw that you recommend thawing and thoroughly draining frozen fruit before using it in this recipe. 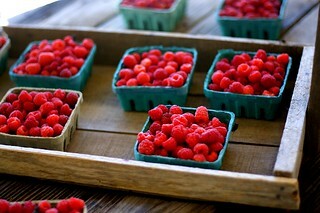 Would you do the same with the raspberries for the breakfast bars? I want to make them and do not want to mess it up! Even frozen raspberries are expensive here in my small town in Southeast Tennessee!! By the way, I love, love the mountains of North Carolina. Even the camping trip when I locked both sets of keys in the car (on a Sunday morning, no less) was fabulous! Amy — Yes, I used frozen raspberries for them. It worked fine. Hapyathome — I have no idea. I believe it was at Shinn. Lenn — I stuck a little list at the end of the post of where we went and what we bought. The only one I didn’t mention was Pindar, because 6 out of the 6 wines we tried were really not great (I’m trying to be nice, but bleh! ), and one was actually turned/rancid. Uh, thanks? Marilee — That has been on my Cook This list for years! Perhaps I’ll finally get to it this winter. I’m glad to learn that someone shares my somewhat fear of scones! I thought I was the only one hesitant to try them. ..there are many others on my site as well. I do recall this book…I’m intrigued. These look wonderful! I’ve always wondered: is pastry flour different from cake flour? (I seem to remember reading that is…and I’ve seen (and used) whole wheat pastry flour, but not white pastry flour.) It’s good to know that all-purpose flour will work – thanks, as always, for that detail. It is a little different, however, I was thinking that cake flour would be a good substitute. Pastry flour is about 8.5 to 9.5 percent protein, while cake flour has 7 to 8.5 percent protein, so it’s close. (All-purpose has 10 to 12 percent.) You could always use 3/4 cake flour and 1/4 all-purpose, as well, for something probably very close. These look great! How do you think they’d be with half (or all?) of the flour subbed out for white whole wheat flour? I’m fine with things having that heartier taste, but sometimes the consistency of stuff gets weird (chiefly with pancakes). Thoughts on what can be done in advance for these? Can you cut the shapes, put in fridge overnight and then bake? Bake the day before? Thoughts? What a great post! Love the photos. Love the recipe. Many, many years ago we lived right outside of NYC and would go to the North Fork of Long Island. I thought it was the greatest. I’m sure it has changed some over the years. 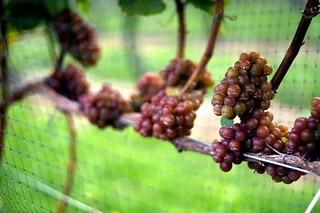 Being on the west coast, it’s great to see what people think of wineries on the east coast. We haven’t been to the NY area in a long time, so this post was particularly interesting to us. We are encouraging bloggers and other wine lovers to add their favorite wineries to a public resource page at our website so other people can get help in discovering wineries to visit when traveling about. 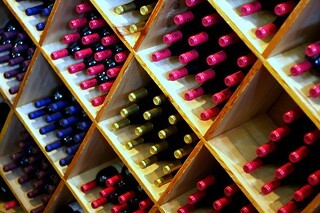 We’d love to see some NY and other east coast wineries represented! Martha — I think a half-swap would definitely work. You can probably do all, too, but I am personally leery of that, only because I feel that baked goods can get a little coarse if they’re all whole grain. Another option is white whole wheat flour, or even white whole wheat pastry flour (I seem to remember Heidi of 101 Cookbooks saying she was a big fan of this) if you can find them. Alllie — I think scones (and biscuits, not that you asked) are great because you can roll them out and freeze them for up to a couple weeks before you use them. Just the time that it takes the oven to reheat is usually enough to defrost them, but if not, you can always add a few minutes to the baking time. However, I don’t think either scones (or biscuits) keep well once baked. I think they’re best within the first day they were baked. These look good–I love homemade scones. By pastry flour do you mean white pastry flour (which I find very hard to find) or whole wheat pastry flour? The pics are gorgeous, btw–such color! I just baked these and they are so delicious! I am actually in the Peace Corps living in a small village, so buttermilk isn’t really something I can get my hands on (I do have pastry flour, golden raisins and carawy on hand though…go figure). I substituted whole milk though, and it worked great. Also my batter wasn’t quite sticky enough to roll and cut, so I just dolloped it onto the baking sheet like cookie dough and they came out lovely. Thanks so much for a great scone recipe – and a low-maintenance one at that – I’ve been looking for a reliable one for a while! I can’t wait for the next time I’m hosting people for brunch! 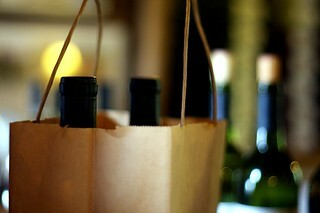 So now instead of heirloom tomatoes, I want to put wine in those bag! Sounds like a wonderful time. Thanks for introducing so many new wines. I can’t wait to try them. This is so unjust. I just brushed my teeth ten minutes ago and then I find your blog. Now I’ll have to go down to the kitchen and eat something just because of you. And then I’ll have to brush my teeth again. Well thanks! This is the most mouth-watering blog I’ve ever seen. Thank you. All of our camera (a Canon 40D) and equipment information and photo philosophy, so to speak, is in this post. I know this is a little off- topic but I don’t know where else to comment…I think you should have a reader “favorite smitten recipe” poll. I am returning to more regular cooking since I am a better winter cook than summer cook and I’ve got to say that the curried lentil recipe on here rocks. It is just sooooo good. And, the winter squash soup and the cauliflower soup and the winter panzella (sp?). I do bake, too, but this is my list of your savory items I love so much. It was so nice to fall in love w/ the curried lentils again! Stop it! It is already so crowded on the North Fork on weekends in the fall that locals don’t even leave their homes if they don’t have to. I live just off the Fork and have been going out there for years but all you damned tourists are ruining it. Go play in the Hamptons. 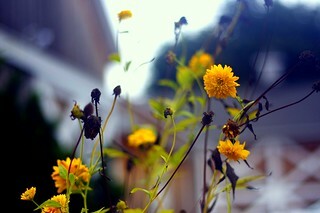 Nice photography here. Keep it up. Ooops, I forgot to say what I would put in those bags! Right now, pumpkin spice coffee from Central Market and all of the groceries for my family of six. I am in Plano, TX. We have lots of great shopping very close by. I am so jealous! Hubby and I try and head out to the North Fork at least once a year. We went last November and hit many of the same vineyards as you did, plus a few more – Baiting Hollow, Ackerly Pond, Macari, The Old Field to name a few. Also had a great time at Vine and The Frisky Oyster out in Greenport! Scones look awesome, by the way – thanks for posting! I can’t wait to try this recipe out. I have yet to find the perfect scone recipe. Although if you ever are in the Missoula, Montana area there’s a bakery called Le Petite Outre that has fantastic scones – not the super sweet kind – the breakfast kind as you say in your blog. I’m thinking I’ll try this recipe with pumpkin. I also tried the slow roasted tomatoes! Excellent on everything – even tuna melts! Thanks Deb! You are my go-to girl for all recipes! It felt fall-like this morning in Seattle so I made these with 1 cup apples, 3/4 cup toasted walnuts and some ginger chopped fine and macerated in simple syrup. Used the sanding sugar and added a bit of cinnamon and ginger to the batter – so good! Ate them with a super sharp English cheddar tucked inside for breakfast outside! Tasty. Thanks again for the fabulous blog. Just made these scones and they are the best I have ever made…so flaky and delicious! Thank you so much. Just made these scones tonight too. I added vanilla and made half the batter with blueberries, and the other half with chocolate chips (for the hubby). They are hard on the outside, soft on the inside and flaky all the way through. Thanks for another winner. yum! this was delicious. i made it with apples & cinnamon. only problem is they were super soft within a day. so now they’re on their way to being bread pudding. any particularly good way to store them to keep them… scone-like longer? 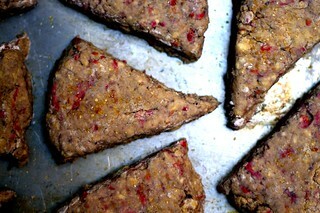 I just made these scones last night with raspberries and wholewheat flour, delish! your recipes are amazing, thanks! I loved the caraway/raisin combo myself; these were super but something seemed, well — missing. Baked another batch with a half teaspoon of salt. That was it. 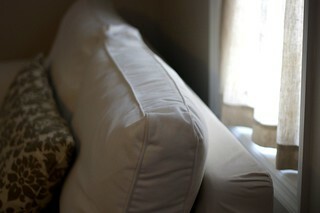 We have a B$B on the North Fork http://www.arborviewhouse.com and we serve some awesome scones. We get our scones from Aldo’s in Greenport. Anyone coming out here should try them, either at Aldo’s of from us. We think (since we were influenced by the British, we are from the former British West Indies) scones, good one are to die for. I’ve made these twice, with much better results the second time. The first time I used the cake flour/ all purpose flour mix, over-mixed the butter, used raspberries and blackberries and unsalted butter. The dough was gooey and hard to work with and the results were awfully bland and kind of flat. The second time they turned out much better — delicious, light and fluffy with a flaky shell. I used all purpose flour, mixed the butter until it was *just* blended, fresh nectarines and added a tsp each of kosher salt and vanilla. The dough looked like dough, with little floury bits that I had to kneed in. I also added the “optional” sprinkle of turbino sugar (the “Sugar in the Raw”), which was a great touch. So, my lessons: 1) careful about the butter (don’t over-mix) and the buttermilk (add it slowly, especially if you’re working with fresh fruit). 2) Use salted butter (and/or add salt) and something extra (vanilla, top sprinkle of sugar) to kick up the flavor a bit. this is a great recipe! thanks for posting it. i’d never made scones before, so i was somewhat wary of the outcome, but they turned out just fine. one thing though: these probably could have been a little sweeter, so next time i’ll either be adding another cup or two of fruit, or doubling the amount of sugar. Picture looks like blueberry (not golden raisin) scones(??) Help! We love blueberries! How can I use fresh or frozen blueberries and still get the same good results? Oh my goodness these are amazing! Perfect. I just made them. I used 1 cup of chopped fresh pears, a handful of dried cranberries, a tablespoon of sunflower seeds, a tsp of honey and a sprinkle of lavender. They are divine! Thanks so much for this recipe, I will continue using it and adding whatever I have lying around! I made these with one banana and 2/3rds white flour and 1/3rd wholemeal flour. Absolutely perfect, probably the best scones I’ve ever eaten in my life–and I did it all by hand (living abroad in a terrible kitchen, no food processor, hand mixer, etc.). Thanks, Deb! I also made them by hand. I also made the dreamy cream scones and my favorite was…. the north fork scones….. thanks Deb! I don’t have a kitchen scale; how many Tablespoons of butter would be equivalent to 6 oz? Just did the math. Am I correct thinking it would be a stick and a half? Christina — Yup, that’s right! Just wanted to let you know that I loved this recipe (and its diet-friendliness) so much, I put it up on Calorie Count, so people could make it and easily track their calories for each scone. I cited you and included links to both your site and your recipe, but wanted to make sure you knew and had no issue with my doing so. I work in publishing and take protection of original content very seriously. You can review the recipe I created to ensure I’ve sufficiently given credit where credit is so deservedly due: http://caloriecount.about.com/smitten-kitchens-delicious-north-fork-recipe-r384299. Michelle — Thanks for sharing. I have to say, I was at Starbucks last year and they have scone — a terrible, dry, artificial-tasting scone — that clocked in at 400 calories. And for the life of me, I cannot figure out how they get so many calories in a scone. I do not make tiny scones and I make them with full fat ingredients and even if you double them (I’m speaking of my cream scones, as well) I cannot make them 400 calories each. No matter how hard I try! So I’m glad I’m not the only one who noticed this. I was looking for a spring dessert recipe and decided to use these as the base for peach shortcakes. Had to supplement with LOTS of extra flour to compensate for the moistness from the raspberries, and instead of rolling them out I treated them more like drop biscuits. True to your notes, these were amazingly light, delicious and wonderful! For the shortcakes, I split them in half, topped with sweetened peaches and a generous dollop of candied ginger whipped cream. I made them fresh for the desserts, but my guess is you could make a batch for breakfast and then use the day-old scones for dessert later. They might even crumble a bit better after sitting out for a while. Either way, I loved the twist on the recipe. Thanks for giving me a great starting point! these are fabulous!! I just made them for breakfast with blueberries and we ate them with omeletes. I think they’ll be all gone for sure in a few hours even though there are only two of us! I’ve never made scones before because I didnt think i liked them but i guess the problem was just that i have never had a good one. I didnt used my hands and a mixed instead of the food processor and they never really turned into dough ( i just plopped the onto the sheet like cookies) but once they baked they were fine.Thanks for another great recipe! deb – made the raspberry version of these and they were delish, but i am commenting to say thanks for the little note about aluminum-free baking powder. those little tips really help not only with one recipe, but many! as usual, thanks! Hello! I made these scones yesterday with the following modifications: for flour I used 1 1/2 c all-purpose and 1 1/4 c white whole wheat, I increased the sugar to 3/8 c, I added 1/2 t salt, and for fruit I used 1 c peeled and chopped firm-ripe pear. I waited a couple minutes after mixing to ensure the liquid was incorporated before scooping them as drop scones on a parchment-lined cookie sheet, then I brushed the tops with cream before sprinkling with course sugar before baking. They were very tasty! I took them to work and several people commented that they thought they tasted breakfasty and substantial with the wheat flour. I served them with a sweet strawberry-raspberry-rhubarb jam and it complemented them very well. On their own, they were not very sweet and I wished for more pears, and if I planned to serve them without jam I would probably increase the fruit to 1 1/2 c and use a more judicious hand with the sprinkled sugar before baking. With pears, I was thinking to add a little ginger or nutmeg, as well, and that might be what I do next time. Thank you for the lovely recipe! im planning on trying these scones this morning! claudia is my mom’s cousin! i still have yet to get to the inn! Love these scones. Let me also HIGHLY recommend the Strawberry Barley scones in Good to the Grain. While they do call for an out-of-the ordinary ingredient (barley flour) they are very easy to make and very addictive. If you’re ever looking for another scone recipe, this is a great one to try! I made these last night, and while they turned out pretty well, they were definitely missing something. I think the lack of salt in the recipe really takes away from the flavor. My go-to scone recipe has been your dreamy cream scones [https://smittenkitchen.com/blog/2006/11/dream-a-little-dream-of-scone/] for the longest time, which are delightfully smooth, moist and rich. Like a few others have mentioned, the north fork scone recipe would do well with a little bit of salt. I usually add about 1/2 teaspoon of salt in. Wow! I made these this morning while everyone in the house was still sleeping. They were light and moist but crisp on the outside. I used white whole wheat flour and 2 bananas diced and some cinnamon. I did have some trouble with the dough being sticky but I just sprinkled more flour on top as I was shaping the dough. I took them out at 25 min and the inside temp was 177F. What is the ideal temp for these scones? I liked your use of temp to determine doneness when I made your Irish soda bread scones. I’ve made this recipe a couple of times in the past month, using fresh tart cherries once and fresh red currants another time. Both times I’ve added small pieces of diced crystalized ginger. They turned out really nice and they have frozen really well. I thaw them out in the microwave for 30 seconds and then reheat in a 350 degree oven for a few minutes. They come out tasting freshly made! This is a recipe I’ll come back to over and over again but probably with a different variation every time! Made these to kick off Labor Day weekend. Loved ’em and so did the rest of my family. I like the lower sugar. I am amazed tho’ that this recipe has no salt. I didn’t miss it but wondered if it would be better with a pinch. Brushed top with egg before sprinkling sugar. Thank you for brightening up our weekend. This were so good! I added a pinch of salt, but stuck true to the recipe (skipped the add-ins, as I was looking for a plain scone), and they came out amazing! The dough was a bit hard to handle–super sticky with the full amount of liquid, but I greased up my hands and was able to shape the dough into balls. I agree that these are awesome in the their own right and hold their own against the dreamy creamy scones–definitely different but as good in their own way. They have a more of a pleasantly crispy outside and are a bit denser inside than the dreamy creamy scones, which are more tender and airy. So these were the best scones ever, so says my mother who has made many a scone. Used blueberries for fruit, and a few small substitutions – swapped 1 c white flour for whole wheat, and didn’t have buttermilk on hand so used yogurt. I also didn’t sprinkle the top with sugar. Tasted so buttery and were perfect heated up from frozen in the toaster. Will make again and again. These were sensational as usual with your recipes Deb! I used blueberries and ended up mixing in the buttermilk by hand as my mixer started smooshing them. Wasn’t difficult though and these turned out perfect! These were so easy to make and so delicious – gluten free! And without kneading or rolling. I used half gf flour mix, and half buckwheat flour, without sugar and with currants and nutmeg and ginger. I also added salt as was mentioned in other comments, so they are mostly savory with the pop of sweetness from the currants. Thanks for these great recipes, Deb!